Praise the sun! Or the reign. Whatever. 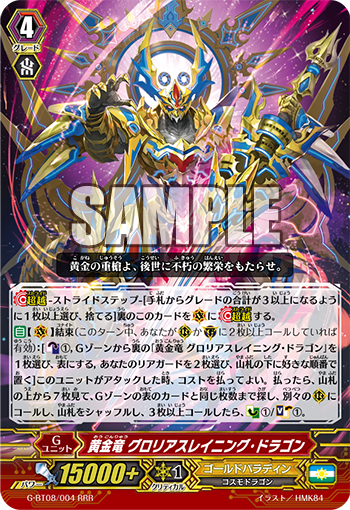 AUTO V Unite (Active during a turn you have called 2 or more units to R and/or G): [CB1, Choose a face-down “Golden Dragon, Glorious Reigning Dragon” from your G-Zone, turn it face-up, choose 2 of your rear-guards, put them on the bottom of your deck in any order] When this unit attacks, you may pay the cost. If you do, look at the top 7 cards of your deck, search for cards among them up to the number of face-up cards in your G-Zone, call them to separate R, shuffle your deck, and if you called 3 or more, CC1/SC1. Today’s card is “Golden Dragon, Glorious Reigning Dragon”, who appears in “Absolute Judgment” (on sale August 26th, 2016)! It’s a Trump Card G Unit who lets you attack continuously with the power of 【Unite】!! 【Unite】 is achieved if you’ve called 2 or more Rearguards! When this card attacks, you can place 2 ally Rearguards on the bottom of your Deck, and look at the top 7 cards of your Deck, and Call allies equal to the number of face-up cards in the G Zone! Because its cost requires a G Persona Blast, you’ll be able to Call at least one copy of this card. And since G Guardians also increase the number of face-up cards, you’ll potentially be able to call multiple Units during the first Stride. You can call four Rearguards and potentially aim for 5 continuous attacks if the fight goes on long enough. If you Call 3 or more Units, you basically get to cancel out the Counter Blast, along with a Soul Charge. Use allies who have finished attacking and boosting for the Cost, and bring out more allies! ← The Cardfighter’s Column – 2016. 08. 12.